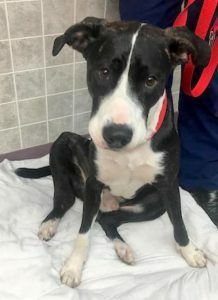 Additional Notes: MALE: Labrador Retriever/ AmStaff mix, 1-2 years old, 57 lbs., black/brindle and white coat, not wearing a collar. Found roaming on Sept.5/18. This dog is in the care of Antigonish Veterinary Clinic.